Books Make a Difference magazine has partnered with workshop leaders Mimi Herman and John Yewell of Writeaways and the team at Elva Resa Publishing to award a FULL SCHOLARSHIP for a military-connected woman writer to attend a weeklong writing workshop in Italy October 17–24, 2018! The scholarship opportunity is open to any military-connected woman age 18 or older. You are eligible to apply if you are an adult female service member or veteran, or if you are the female spouse of a current service member or retired veteran, a military widow, or the mother, daughter, or sister of a current service member. We are looking for a committed writer with a work in progress who would benefit from the encouragement, guidance, and concentrated writing time a workshop experience like this provides. 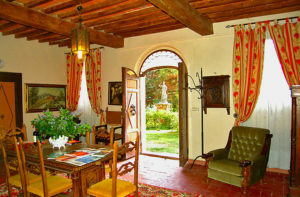 The Writeaway will take place in a 17th century villa in the heart of Tuscany. With Mimi and John as your guides, you’ll find the stories you’ve been longing to tell, the poems you’ve always wanted to write, or the memoir you’ve always wanted to compose. They’ll help you shape your writing project, improve your writing technique, and make your writing as compelling on the page as it is in your imagination. The Tuscany Writeaway includes daily writing workshops, individual consultations with Mimi and John, an Italian cooking class, food, wine, and local excursions. Participants will stay at two neighboring villas—Villa Cini and Villa Casanova—located in the Chianti region of Tuscany, only a kilometer from the village of Badia Agnano and an easy drive or train ride away from Florence, Sienna, and Arezzo. While the writing program is rigorous, there is also plenty of time to get to know your fellow Writeaway colleagues. For more details about the Writeaway schedule, visit Writeaways.com/writeaway-in-italy. This scholarship covers your airfare, Writeaway tuition, room, meals and drinks at the villa, and an Italian cooking class. Complimentary shared ground transportation is available from the train station in Bucine to the villa, or you may rent a car at your own expense. Within six months following the Writeaway, you may submit your manuscript for review and receive a one-hour phone consultation with a senior editor at Elva Resa Publishing. A one-page cover letter of fewer than 500 words telling us how this Writeaway will make a difference to you as a writer or how it will further your writing goals. A 500- to 1000-word writing sample of a current work in progress. By applying, you are confirming you are a woman age 18 or older, you have a valid passport that does not expire within six months of the travel dates, and you are able and available to travel to Italy and attend the entire Writeaway during the week of October 17–24, 2018. Scholarship winner will be notified in July and must confirm acceptance within one week. Travel arrangements will be confirmed in July; scholarship recipient will be asked to provide passport number and other personal information needed for travel arrangements. Any taxes as a result of being awarded the scholarship (approximate value $3800), as well as any additional travel expenses or other incidentals are the responsibility of the scholarship recipient. ElvaResa.com – Books for and about military families. 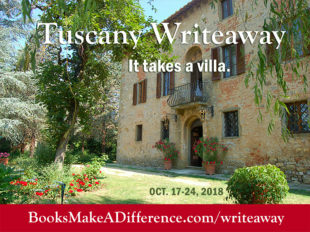 BooksMakeADifference.com/writeaway – Yearlong coverage of writing workshops, including what it’s like to attend a workshop, how to prepare, what it takes to lead one, and interviews with our Tuscany Writeaway workshop leaders and scholarship winner. A team member from Books Make a Difference will attend the Tuscany Writeaway (in a paid slot) as a full writer participant and we’ll cover the experience in the Writeaway section of the magazine. Tuscany Writeaway Scholarship Applications will be accepted online March 18–May 31, 2018. Are poets included for your scholarship consideration? I was an army nurse during the Vietnam war. Yes, Mary! We’d love to see your entry. Thank you for your service and your interest in the Writeaway. I am a retired, 100% disabled female Army Veteran, who joined the military on the delayed entry program for a one year background clearance of TSBISCI combat clearance in 1982. I terminated my career in 1998 with a medical retirement with physical and PTSD and MST issues. I love to challenge adversity in life and find joy in many avenues daily. I encourage myself and others to focus on constructive aspects of life. I have many hobbies that have been nurtured into talents with the help of Veteran extracurricular programs. The military taught me to keep secrets, that is how I became an abstract artist in words, thought, and image. I still am not able to reveal my personal history, my actual Military work, locations where I worked or my inner feelings. I created my own language to become a chameleon among other military members, while still having a way of expressing myself. I am excited about the opportunity to continue to develop these skills. MaryAnn, Thank you for your service and for sharing a bit of your journey with us. And thanks for your interest in the Writeaway. As writers and book lovers, we are happy to hear that writing is playing a role in your continued healing. All the best to you!